FINPACK Online Training is available at https://fptrain.cffm.umn.edu. This site does require paid access, so the user is required to sign-in. 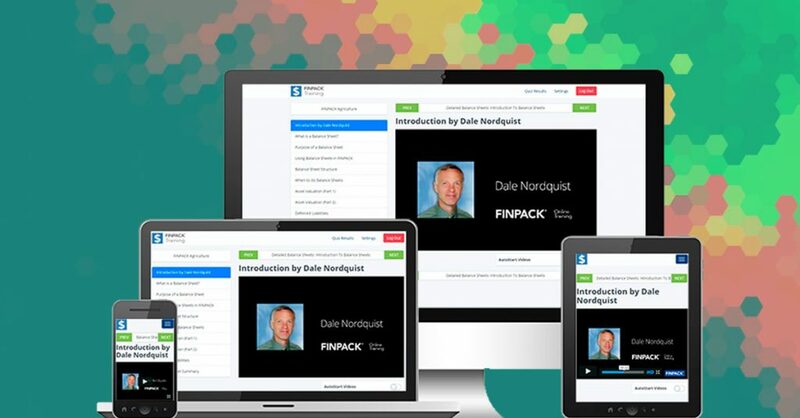 Many lending institutions have continual access to FINPACK Online Training. If you do not have access and are interested contact The FINPACK Team for more information. There are 257 total videos related to the FINPACK Projection tools. These are broken into 5 minute or less segments on a specific aspect of using the FINPACK Projection tool. In online training, you can choose to watch all videos within a module or only those pertaining to your current needs. For example, there are 43 videos pertaining to annual types of cash flow projections. If you are most interested in learning how to do a multiple year cash flow, then simply watch that 2 minute video under Advanced Entries. Online training also includes a case farm exercise and quizzes, giving users the opportunity for applied experience with FINPACK. Attending a training session or taking the time to watch a training video isn’t always conducive. Therefore, several other options are available to assist with learning the ropes of the new Projection tool. As always, FINPACK Support is available to answer questions during regular business hours. FINPACK Help is available throughout the program. Click “F1” at any time in FINPACK to open Help related to the specific topic. Or navigate to Help + Contents to access the full contents of FINPACK Help. This accesses the full FINPACK User’s Manual. Cash Flow Projections Overview. This series of short recordings introduces users to the FINPACK Projections update by introducing the new tools and outlining the updates to the Legacy Projections tools. As a reminder, the FINPACK Legacy Projections will be phased out with the 2020 software update. Begin getting comfortable with the new FINPACK Projection tools this renewal season. Using these Help options will assist you with the process.